Grand Theft Auto Online "cash pack" prices have surfaced, seemingly confirming that the game will offer microtransactions. 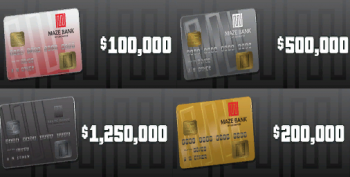 The rumor went around yesterday that Grand Theft Auto Online may allow players to get a leg up in the game through microtransactions, after a Reddit user dug up a file that made reference to them and included an image of "cash cards." Today that rumor takes on some extra weight, as Eurogamer claims to have pricing information on those cards, supplied by a source with early access to the game, which - if true - confirms that microtransactions are indeed on the menu. The site also noted that while GTA Online takes place in the same world as Grand Theft Auto 5, in-game prices don't match up. Some items are less expensive in the online game - a $1 million GTA V car runs about $150,000 in Online, while the most expensive property is $400,000 - but others, like weapons and car mods, cost more. Many items are also locked out for low-level characters, which means that even players who fork over for cash cards will have to level up before they have really choice stuff on which to spend them. Bear in mind that while it sounds pretty solid, it's all just rumor at this point, as Rockstar has yet to confirm or comment way or the other. It will have to say something about it fairly soon, however; Grand Theft Auto Online is scheduled to go live on October 1.